Bushnell 224210 10x42mm Natureview Binoculars 224210 FREE SHIPPING! Bushnell's 10x 42 mm Natureview® Binoculars (model 224210) offer a crisp, clear view every time thanks to its BaK-4 Porro prisms and multi-coated lenses. Get quality comfort views with the rubber, anti-slip armor - which also adsorbs shock - so you can comfortably hold this for long periods of time. This also comes ready to mount on a tripod. View get up to 10x magnification, making these great for extra-wide, long-distance viewing both outdoors and in stadiums. The twist-up eye cups also allow for single-eye relief as needed. These binoculars are tough yet light, at only 19.2 ounces, and include a textured center-focusing knob to precisely focus your view with ease. All Bushnell binoculars are made with environmental-friendly, lead-free glass so you will enjoy nature with minimal impact. 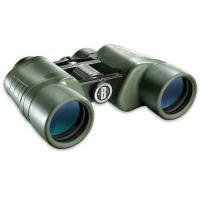 ©2002-2019 CopsPlus.com: Bushnell 224210 10x42mm Natureview Binoculars 224210 FREE SHIPPING!